Writing product descriptions and taking photos for your online inventory can be a daunting task. Many small business owners take on the process themselves and never think much about it. However, it’s important to realize that there are people who specialize their entire lives in both of those fields to become experts. Some photographers only specialize in product photography, and there are professional writers who are solely copywriters that write product descriptions. If asked, both of these types of professionals would consider what they do a very complex line of work. Many of them even have degrees in photojournalism, marketing, or photography. That is a good reason to stop and consider all of the aspects of creating descriptions and photo for the products on your own online store before jumping in. Product photography is the closest thing you will do to art in running your business. Unless, of course, your business is creating art. A great photographer Vernon Trent once said, “Amateurs worry about equipment. Professionals worry about money. Masters worry about light.” This holds true across the entire spectrum (pun intended) of photography. You can (almost) never have too much light. You can (almost) never get too close. Make your background count. Either use an “infinity background” or place the product in a natural setting where the customer is likely to use it. An infinity background is simply creating a solid color background with no defined sides. Imagine if you were to take a long roll of white paper or fabric and roll it out across a room and tack the end of it to the top of the wall. That is a large-scale infinity background. You won’t notice a floor or wall in an image of a product sitting in front of it. 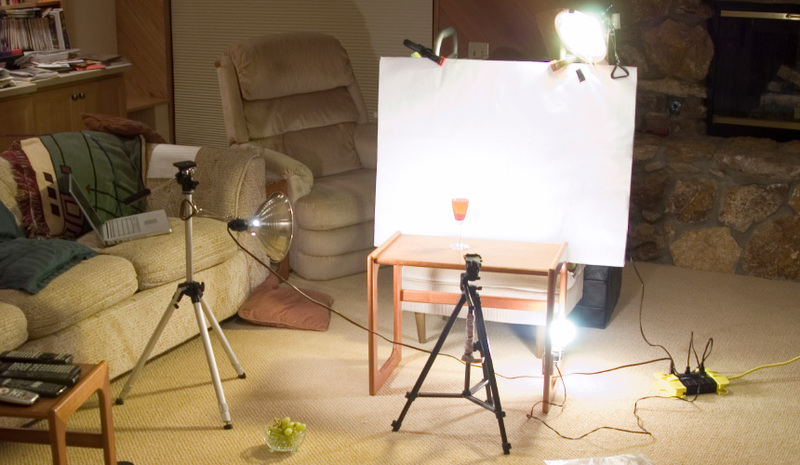 Use a tripod and a timer. Cameras work by opening a shutter for a brief moment and capturing all of the light that enters the hole. While that shutter is open, if anything moves in the frame it will show up as a blur or out of focus image. One thing that can create movement when the shutter is open is the actual act of pushing the button to open it. Your hand will slightly tilt the camera each time the button is pushed and released. Also, it’s impossible to hold perfectly still even for the shortest of moments while the shutter is open. These are the reasons you use a tripod and timer for an extra crisp shot. Include some scale reference if necessary. You don’t want your customer to be deceived by thinking the product is either larger or smaller than it really is. Shoot all of the variations of your product you offer for sale. If it’s available in green or red, take a photo of both. Writing product descriptions may seem like a simple task compare with shooting creative product photography, but there are several things you need to consider. Aside from accurately describing the product in detail, you also need to consider your audience. Your audience is not just your customer. Search engines send out crawlers or bots to your online store that read all of the text and image tags on a screen to determine what exactly your page is about. The search engines then use this information to determine where to deliver your site in search results for a particular product. In other words, the better the SEO (Search Engine Optimization) of your product listing, the better chance someone searching for your product will find it. One of the most important rules to remember is to keep all of your descriptions unique. To ensure they are unique, don’t simply go to the manufacturer’s website and copy and paste the description they list for the product you are selling. It’s fine to include it, but be sure to include your own personally written description as well. Search engines notoriously do not favor duplicate content. If 20 stores are selling the same product as you, and they all have the same description, then your site is no different than the others. Providing unique content adds value to the user experience, and search engines like to give their users added value. Another very important aspect of copyrighting is to make the content engaging, share-worthy, or entertaining. Most readers of e-commerce websites are scanners. They are skimming the pages trying to pull the most useful information to make a purchasing decision. Keep your sentences to the point and use a combination of text and bullets to split up content. Speak with an appropriate tone and formality for your audience. If appropriate, use humor or stories to engage the visitor. At Jooy.com, we offer several pricing options that include a variety of detail in your listings. For a basic store with a single product photograph per product, it’s completely free to create an online store with us. If you need multiple photos per product or want to create a large store, then you can sign up for one of our paid plans based on the level you need. We’ve tiered our pricing and service options so you are only paying for exactly what you need. Get started today and upload photos of your products using our easy to use photo upload tool.